PRE-7110 advanced diagnostic testing electric motors with engine running and engine off. This course explores the predictive diagnostic techniques for electric motors such as vibration analysis, current, flow tensiny magntico. Acquire knowledge of the different predictive techniques both as aesthetic dynamics that allow electrical and diagnostics of machines to develop a predictive scheme. Predictive Maintenance. Predictive parameters applied and technicians amquinas ELECTRICAL. Avera diagnostic engine vibration using spectral analysis. Description of the technique. Identification number of Avera and board diagnostics. RESOLUTION historical case. Avera diagnostic engine power by spectral analysis. Description of the technique. Identification number of Avera and board diagnostics. RESOLUTION historical case. 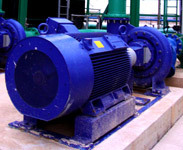 Application of infrared thermograph electric motors. Description of the technique. Concepts of radiation. Discoverable hot spots. RESOLUTION historical case. Avera diagnostic tests using aesthetic. RESOLUTION historical case. Avera diagnostics by partial discharges. Description of the technique. Isolated and resolved status of historical cases. Avera engine diagnostics using spectral analysis of dispersion magntico flow. Description of the technique. Identification number of Avera and board diagnostics. RESOLUTION historical case.